'Slow fashion' asks: Who made your clothes? 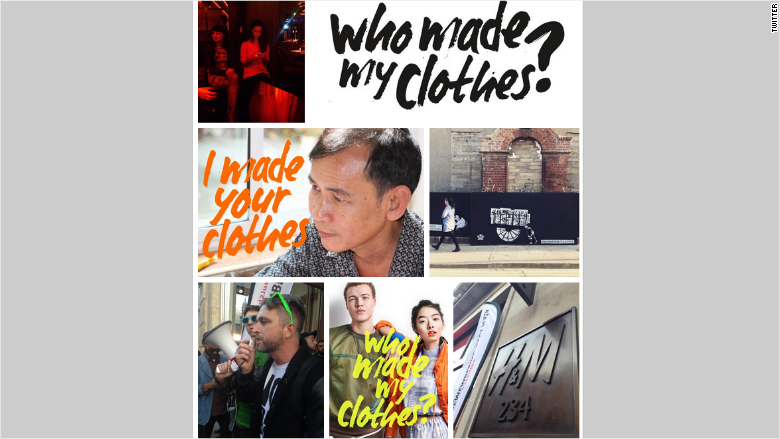 On the two-year anniversary of the deadly Bangladeshi clothing factory collapse on Friday, a coalition of socially responsible companies and activists are asking people to post their shirt tag photo on social media using #whomademyclothes. "It should be a a simple questions to answer," said Maxine Bédat, a campaign organizer and co-founder of the online retailer Zady. "But the fact is, many brands don't know." Even after the Rana Plaza disaster -- which killed over 1,100 people -- Bédat said many clothing companies still outsource production to factories that pay too little, pollute too much, and put too many people at risk. "They area called shadow factories," she said, explaining that the clothing brand may sign a contract with one factory, which it audits, but then that factory outsources the work elsewhere. "They have to do that to produce at the cost and the speed they are being asked to." Borrowing from the Slow Food movement -- which is supposed to be everything fast food is not -- Bédat and others are part of what's becoming known as 'slow fashion.' They aim to make clothes from sustainably produced fibers, cut and sewn in safe, clean factories, and made by people paid a living wage. While the clothes may be more expensive to buy, Bédat said clothes like this are better made and therefore last much longer. The goal of Friday's campaign -- known as Fashion Revolution Day -- is to both get people thinking about where their clothes come from and to show major clothing companies that the public cares. "Brands are always looking for the next trend to follow," she said. "People have a chance to say that it's sustainability." The effort is unfolding across 71 countries and involves companies including American Apparel, Patagonia and Eileen Fisher.